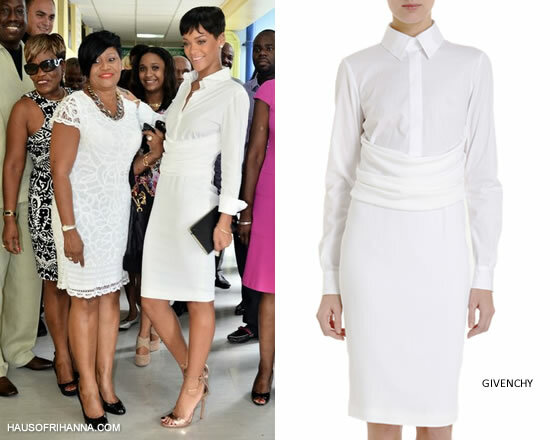 Yesterday Rihanna was all smiles as she attended a ceremony at the Queen Elizabeth Hospital here in Barbados. Rih donated BDS$3.5 million (US$1.75 million) in equipment through her Clara Lionel Foundation, which she started earlier this year. The radiotherapy department of the hospital was also renamed in honour of her late grandmother, Clara Brathwaite. Rihanna looked gorgeous in a white shirt dress by Givenchy and gold sandals. The button front dress has draped wrap-around belt detail at the waist and draping at the back. The dress is sold out almost everywhere but a few are still available at Yoox.